I am constantly amazed by how much technology has sped up so many facets of our world. Of course, this is particularly true in the information-seeking realm. Many times, people worry that all of the technology that is speeding things up is also hurting people’s ability, or willingness, to read a good book. But sometimes, technology can help bring people to their library. One such tool that I use–and recommend–constantly is Library Extension. Some of you might already know about this amazing extension. But in recent discussions with both library and teacher colleagues, I was surprised by how many were excited to hear about it. That seemed like a good reason to share about Library Extension here! Wouldn’t it be great if there was a way students could see if materials were available from their school or local library without having to visit a separate site? Well, now there is! Library Extension: What Is It? 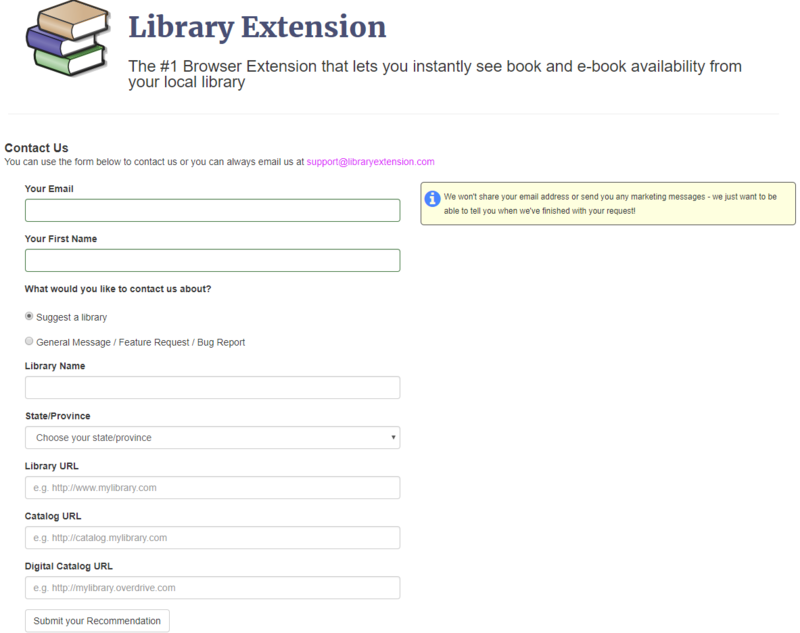 Library Extension is a free extension for the Chrome web browser. It lets users instantly view whether a book they’re looking at online is available at their chosen libraries. Once the extension is installed, it runs in the background, popping up when it’s needed. How Does Library Extension Work? When you install Library Extension, it asks users to identify the libraries from which they get books–physical or digital. There are several thousand libraries in the Library Extension database to choose from. More are being added all the time. Once users have set up their preferences, Library Extension sits in the background, waiting for users to visit a web page about books. Amzaon, Audible, Barnes and Noble, GoodReads–if it lists books, Library Extension will pounce! (Technically, it runs on 17 different book-oriented sites, which you can view on their Frequently Asked Questions page). When a user lands on one of these pages, Library Extension goes to work. It checks the catalogs of the user’s chosen libraries and pops up a panel right on the current web page. That panel lists which libraries have copies of the book. 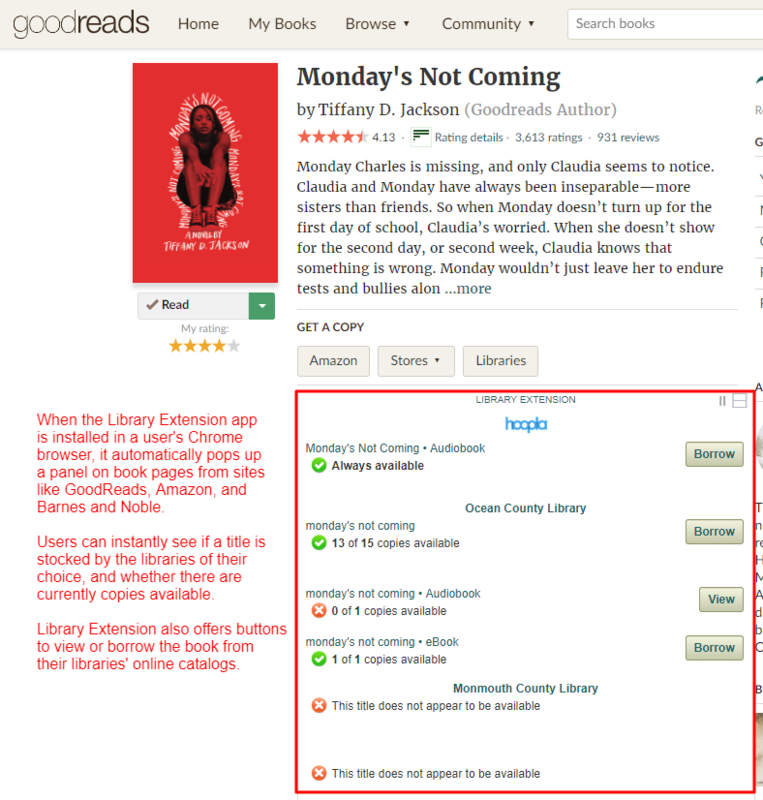 It also offers a button that will bring users to each library’s catalog, where users can sign in and reserve books. If you’re so inclined, feel free to check out the three minute Library Extension introductory video I made for my colleagues. But Wait, There’s More: Add Your School Library! Not only is Library Extension a boon to users, it can help libraries connect with their patrons and students. Yes, I said students, because it’s possible to submit a school library to Library Extension’s list of available libraries. It’s as easy as sending an email with a link to the library’s online catalog. And, once again, it’s free! My middle school recently added our library. This lets my students immediately see if a title they’re browsing on Goodreads is waiting for them just steps down the hall. I have encouraged all of my students to add the extension. They have started to see how much time (and money!) they can save as they see how many of the titles they are interested in online are available from our school and local libraries. As long as your library has a public-facing web catalog, it’s just a matter of submitting the links and information about your library. If a library isn’t listed in the Library Extension database, it’s extremely easy to get it added. Library Extension is a powerful tool to help students connect with the collection in your school library! When readers engage with book-finding sites online, it provides them with instant information about titles of interest. When those sites have social content that encourages them to learn about things their friends are reading, like Goodreads, they are even more likely to read. Library Extension helps converts that interest into action. And if we get a visit to the library in the bargain, so much the better. What a powerful moment for literacy!